On the fence about legalizing marijuana? If so, consider this: legalizing weed could save your life. In the most comprehensive study of its kind ever conducted, the Institute for the Study of Labor has revealed in a provisional discussion paper that the legalization of medical marijuana in the United States is linked to a dramatic decrease in traffic fatalities. Before we go any further, let's clear two things up. First: driving impaired — whether you're drunk or stoned — is always a terrible idea. Second: statistically speaking, it's been clear for a while that driving drunk is a much more dangerous move than driving while stoned. Back in 2009, a review published in the American Journal of Addiction concluded that alcohol's detrimental effects on the performance of complex driving tasks, combined with its tendency to increase risk-taking behavior, make it significantly more dangerous than pot when it comes to driving under the influence. Just how dangerous are we talking? A 2005 study of close to 11,000 French motor vehicle fatalities found that while rates of alcohol and cannabis intoxication in the drivers were similar (nearly 3%), ten times as many crashes were associated with alcohol as with cannabis. Of course, demonstrating with science that one drug is more dangerous than another doesn't make driving under the influence of either any more acceptable. What it does do, however, is highlight a glaring non-sequitur, namely that here in the States, it's the pot that's most likely to get you in trouble with the law. Which brings us back to legalization. 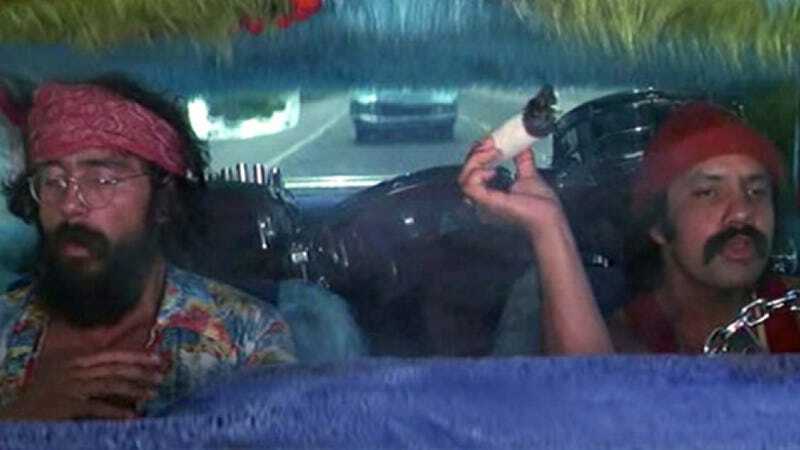 Believe it or not, the study released yesterday by The Institute for the Study of Labor is the first to examine the relationship between the legalization of medical marijuana and traffic deaths. Researchers Daniel Rees and Mark Anderson conducted the study using data from a number of sources (provided by the Centers for Disease Control and states that have passed medical marijuana legislation), including the National Survey on Drug Use and Health, the Behavioral Risk Factor Surveillance System, and the Fatality Analysis Reporting System. To date, 16 states have passed medical marijuana laws, yet very little is known about their effects. Using state-level data, we examine the relationship between medical marijuana laws and a variety of outcomes. Legalization of medical marijuana is associated with increased use of marijuana among adults, but not among minors. In addition, legalization is associated with a nearly 9 percent decrease in traffic fatalities, most likely due to its impact on alcohol consumption. The study goes on to explain that the 9% decline in traffic fatalities can be accounted for almost entirely by a drop in alcohol-related traffic deaths, and that the increased use of marijuana observed in adults has corresponded with a drop in alcohol consumption. In other words, the data suggests that alcohol and weed are substitutes — with pot winning out in the safety department, at least when it comes to highway fatalities. Rees agrees, adding that while he and Anderson "make no policy recommendations, it certainly appears as though medical marijuana laws are making our highways safer."